Come Summertime, plums would appear in a bowl on the kitchen table, nestled amongst Cox’s Pippin apples and Conference pears. But I rarely reached for them, preferring the convenience of an apple that didn’t leak and make hands awkwardly sticky. Now a ‘grownup’, with a family and a bit of land, we’ve planted apple, pear and plum. They hunker down in a little orchard that we’ve fenced off from the deer, who would strip the young trees within minutes, given the chance. 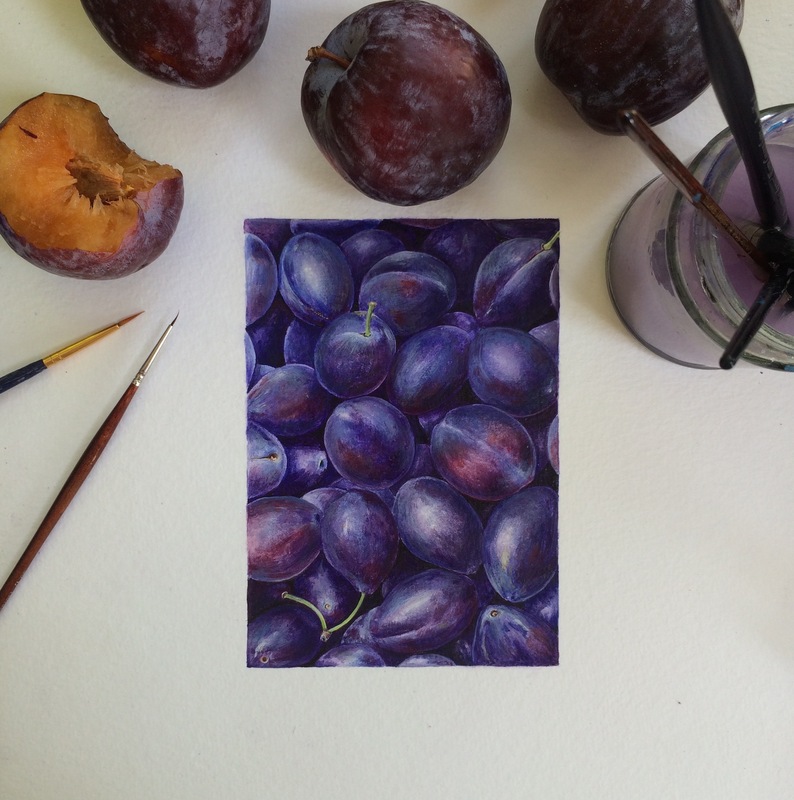 In July it is one of the greatest pleasures, to slip down, alone, to the orchard, and pick a sun ripened plum. Standing beneath the little tree, with the sun on my back, a warm and voluptuous plum in my hand… the wave of delicate perfume radiating from the blush and bloom of this Rubenesque jewel; a flavour bomb waiting to happen: utterly beguiling. And then there’s that first bite… the lick-of-the-lips smooth skin as tongue guides teeth to the plump ‘give’ point… the give to the gave, as teeth pierce to flesh; it’s messy. Juice will always roll down from palm to wrist, and if unchecked, will trickle to the bony tip of an elbow as, throwing all caution to the wind, you go in for a second bite. It’s perhaps one of the most sensuous fruits, second only to a ripened fig. Summer love, in all it’s fresh and sweet abandon. 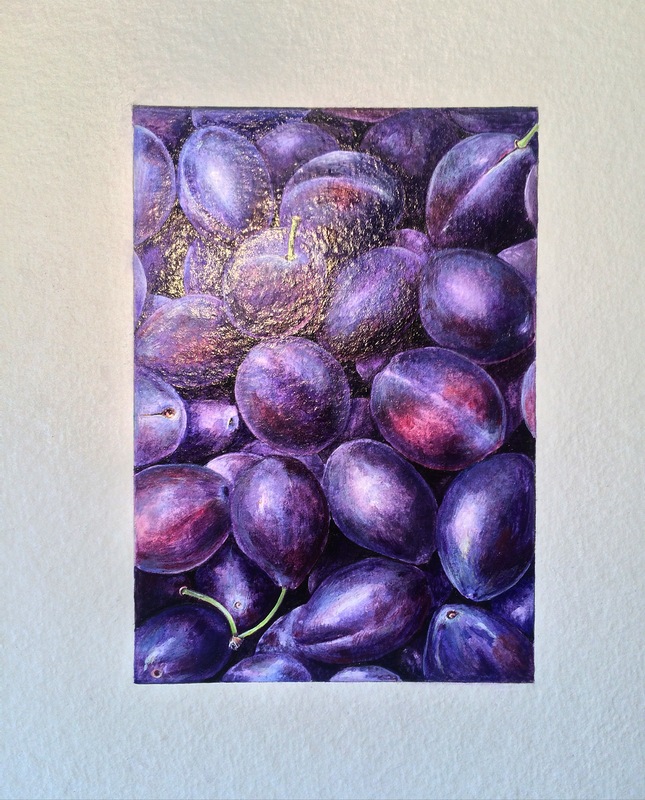 And no one wants it to end… so you reach for another plum. As I write this, I’m working my way through the left over ‘models’ from the egg tempera illustration above… “tinker, tailor, soldier, sailor…” I feel as if I’ve cheated a little, enwrapped as I am in this deliciously sweet moment before time… it is only May.